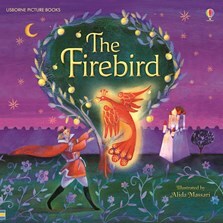 A colourful and sumptuously illustrated retelling of the much-loved Russian folktale. Prince Ivan sets out in search of the mysterious Firebird, which has been stealing golden apples from the King’s orchard. On his journey he meets magical beasts, a wicked wizard and a captive princess. A story of bravery, determination and magic that has captivated generations, retold in simple language for children.